«It has always been my conviction that the social space is limited, and the path to freedom leads through the artistic space, which is outside of social space. Of course I realize that this is not a universal path to freedom; but for me it was always the only possible one. The possibility of expressing this very independence, this distinction between the artists space and the social space, and at the same time the limits of the power of the social space, offered itself directly in the picture I was working on at that time. That is exactly what I tried to do in Entrance-no Entrance which I began in 1973 and did not complete until 1975. The red letters “VKHODA NET” (“NO ENTRANCE”), cancel out the word “VKHOD” (“ENTRANCE”) which is inscribed on each side and recedes systematically into the depth of the picture. At first sight, it is not a picture at all but some kind of absurd proclamation of a apparently ironic nature. But it is a good idea to take a closer look at it nevertheless. The word “VKHOD” is clearly expressive of space, and, be receding into the depth of the picture via perspective foreshortening, plastically demonstrates the reality of the space. The words “VKHODA NET”, which represent the plane surface, plastically demonstrate the reality of this plane and thus declare the space non-existent as it were. At the same time, both letterings have a clear-cut social import. The red letters bar us from entering. Entering what? A space that is on the other side of the surface of the picture, behind the picture, so to speak. However, by indicating the boundary that we are not allowed to cross, this text, also automatically demonstrates the limits of its own possibilities. The surface of the picture is , after all, also the limits of its own power. The space on this side of the boundary does not belong to it. That is to say, the surface functions as boundary of the social space here. As far as the victory of red over blue is concerned, this should apparently not be considered unconditional. After all, the letters “DA” (“YES”) stand in the centre of the red line – precisely where the perspective lines of the blue letters meet behind them, the point of their maximum depth. In addition, the “DA-NET” (“YES-NO”) combination gives the prohibition a certain contradictoriness, casts doubt on it», - Erik Bulatov: “Freedom is Freedom”, Kerber Verlag, 2007. «In “Entrance- No Entrance” the visual effect is created only by the connection between the letters and background. This work was also decisive in shaping the artists’ ideas, as it forced him to solve the problem of space and flatness. The text prohibiting entrance is written in red Cyrillic letters on a flat tangible space. It is truly impossible to enter the picture. There is faint hint of Soviet reality and the prevalence of bans. The use of red in painting runs contrary to the effect of depth, and is therefore a foe of space. We get the impression that these prohibiting words are coming toward us of out the canvas. The double fence of blue letters along the edges of this picture, on contrary, invites the viewer to come into the while void of the canvas. Blue has always helped create depth. White is neutral. It can be either space or flatness. The final meaning of the phrase “No Entrance” is that entrance is prohibited, yet it is placed I n such a way that the end of the first word (“da” or yes) appears in the centre of the composition, which is completely contradicts the prohibitory phrase. 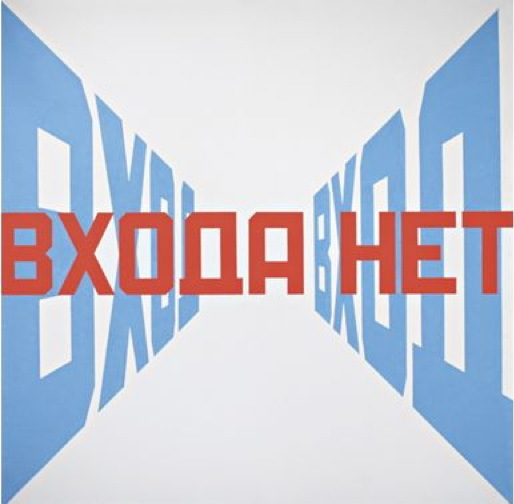 Free will , wishes and dreams are set in opposition to the omnipresent ban», - B. Lorquin (Erik Bulatov, Moscow, 2006).